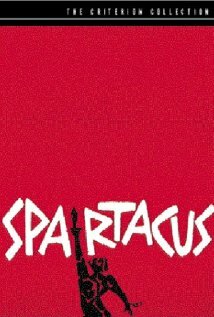 In 73 BCE, a Thracian slave leads a revolt at a gladiatorial school run by Lentulus Batiatus. The uprising soon spreads across Italy involving thousand of slaves. The plan is to acquire sufficient funds to hire ships from Silesian pirates who could the transport them to other lands from Brandisium in the south of Italy. The Roman Senator Gracchus schemes to have Marcus Publius Glabrus, Commander of the garrison of Rome, lead an army against the slaves who are living on Vesuvius. When Glabrus is defeated his mentor, Senator and General Marcus Licinius Crassus is greatly embarrassed and leads his own army against the slaves. Spartacus and the thousands of freed slaves successfully make their way to Brandisium only to find that the Silesians have abandoned them. They then turn north and must face the might of Rome. Taglines: More titanic than any story ever told! A number of scenes featuring Peter Ustinov and Charles Laughton were rewritten by Ustinov after Laughton rejected the original script. Anachronisms: Slaves digging with steel shovels of a pattern invented in the early 20th century instead of Roman wooden spades. This is Kubrick's farewell to Hollywood. I would have liked to be a fly on the wall. I don't believe for a minute that it was a cordial parting of the ways. I mean, Kubrick never returned, never! With "Paths of Glory" Kubrick gave Kirk Douglas, not just his best part as an actor, but his best movie. 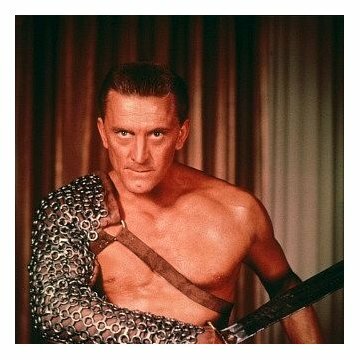 By the time Douglas called Kubrick to "take over" "Spartacus" Douglas was already a huge star with too much saying in the matter. Look at it, it's clear. 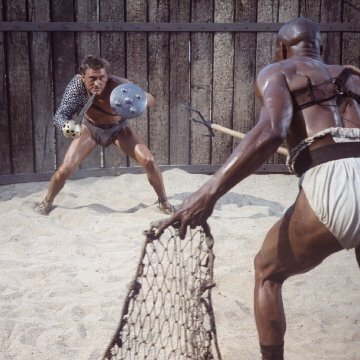 "Spartacus" is more Douglas than Kubrick. Great fun to watch, yes, absolutely. A terrific script by black listed Dalton Trumbo. Some fight sequences unequalled in the history of film. 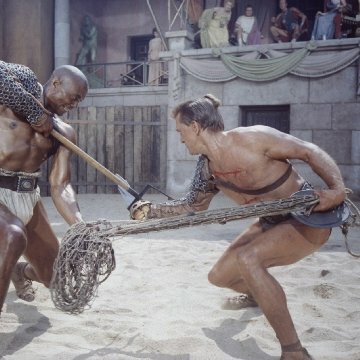 Look at the fight between Douglas and Woody Strode and compare it to the ones in "Troy" or "Gladiator" for that matter. It is sad an embarrassing to realise how low we've fallen. Computer generated images or not. The cast is unbelievable but it's clearly not Kubrick's. The casting of his movies was part of his master plan. He would cast a Ryan O'Neil as Barry Lyndon for instance so he can blend perfectly with the magnificent tapestry, without adding any colours of his own. The same can be said of Keir Dullea, in 2001, a robotic non entity in a showdown with a voice. When he needed actors to be at the very pinnacle of his universe he went to Peter Sellers, Malcolm McDowell or James Mason. Even the casting of Tom Cruise made a lot of sense. He used the star and his wife to talk about the dreamlike powers of betrayal. 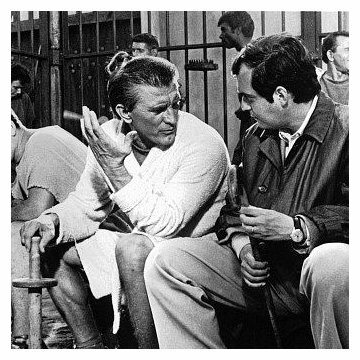 In "Spartacus" Tony Curtis, plays Antoninus, a teacher of the classics. A campy idea never seen in a Kubrick film, before or since. To be fair, there are some spot on, brilliant pieces of casting. Charles Laughton is, as usual, superb. Peter Ustinov, terrific. Laurence Olivier manages to give a multifaceted portrait of weakness, fear and greed. Jean Simmons makes the reason to survive totally believable. But the cutesy love scene between her and a shiny muscular, coiffed Spartacus is truly terrible. As a final blow, the scene is enveloped in a sticky, corny music theme. Having said all that. Don't you dare missing this epic. I'ts Kubrick's goodbye to Hollywood and like everything else that the master said or do, he really meant it.